Naples, the birthplace of pizza, is being invaded. Local businesses selling pizza are under attack by a foreign product: French Fries. Papà Paolo, the master pizzaiolo, is obviously offended by foreign food trying to take over his city. He himself is too old to pick up the Rolling Pin of War, so he does what anyone in his position would do: he starts looking for a successor to do battle against the Evil Fries Empire. Surprisingly, Google does not find anything related to the French Fries Invasion of Naples. They must have been paid off by Big Fries, one of the world’s most notorious industries. But I have no reason to doubt the story of Papà Paolo. And so you, a promising pizzaiolo, must make the best pizza you can to succeed Papà Paolo and repel the Fry Incursion. Backstory aside, it may be surprising to some that a game about pizza in the very birthplace of the legendary baked goods does not concern itself at all with the production. Papà Paolo is all about getting pie to the people. Your objective in this game by Fabrice Vandenbogaerde is to place workers and lay tiles to bring pizza to peoples’ doors. 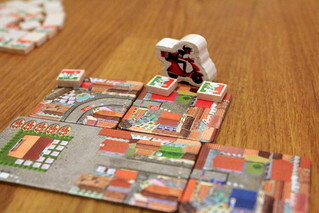 Papà Paolo combines worker placement with tile laying and auctioning. 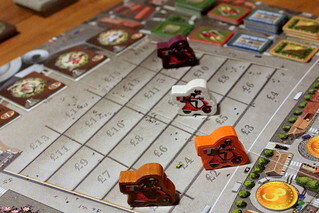 A game lasts five rounds, during which players deliver as much pizza as they can and expand their pizza infrastructure. Each round starts with the worker placement part. 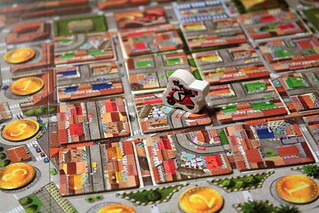 Players have four fattorineeple (fattorino della pizza being Italian for pizza delivery boy, and they are meeples) each to place and the city grid always has four spaces per player. Taking turns, each player puts a fattorineeple – riding a scooter, by the way – on the grid. That’s not the only decision, however. Each space on the grid offers a few options. When placing a fattorineeple, you can decide to take the city tile from that space and place it in your neighborhood. City tiles show streets that should connect to existing streets in your neighborhood, and they show roofs in different colors for houses that ordered pizza from you. Your neighborhood is your own play area where other players cannot interfere. But don’t worry, there is plenty of interaction in the other parts of the game. Instead of taking a city tile, you can also perform the action for the row or the column of the space that you placed in. There are four actions, three of them are tied to the experience tracks on your player board. You can seek a sponsor, defined here as a person that gives you money but doesn’t expect anything in return. You simply take as many coins as the yellow experience track tells you, between three and thirteen. In the second action you spend money to buy ingredients to make pizza. Those are actually rather expensive, but the higher you are on the blue experience track the more pizza you make for free, on top of what you buy. Action number three lets you immediately make an express delivery, following the same rules as a regular delivery later in the turn. The red experience track tells you how many pizzas you may deliver with your Pizza Prime service. Finally, the last action lets you add another one of your pizzerias to your neighborhood. This last action is not tied to any experience track, you always build one pizzeria and it always starts with two pies ready to roll. Besides the action or the tile, there is another thing to consider when placing your fattorineeple. For each row and column there is a coin, valued from one to three Lira, that will go to the player with the majority there. If you can snag the high values and bid conservatively in the auctions, then that money is almost everything you need, without ever taking the Sponsor action. But when trying for majorities, you might end up not picking the actions or tiles that help you most. How I love it when there is no obvious best decision. After those majority bonuses are awarded you enter the auction phase. It happens on the other half of the main board, on the stairs of the piazza. Here, you buy a pizza delivery tile that tells you how many pizzas you may deliver and how far your fattorini may move in the following phase. There is one tile per player and players bid on them by moving one of their fattorineeple on the stairs. The higher up they go, the more money they are bidding. When a player is outbid on a tile, they have to make a new bid on their next turn. Either they outbid their competitor again, or they move to another tile. The auction only ends when there is exactly one bidder on each tile. In the auction, too, there are different factors to influence your decisions. You usually want the best delivery tile, which is always to the right. But the player winning the leftmost tile will be the start player for the next round, and that makes a big difference in Papà Paolo. You also, obviously, want to spend as little money as possible. But the player highest on the stairs gets first pick of a bonus tile. A bonus tile lets you either take one of the four actions from the worker placement phase immediately, or it lets you advance one of your experience tracks. Those bonuses are pretty nice, nice enough that you will consider paying more than you have to in order to get first pick. And since the auction ends immediately when the players reach a stable state, you will sometimes bid even higher, because you won’t get a chance to bid more if no one is interested in your tile. Decisions, decisions, decisions. And finally, after all that, you deliver pizza. This is the one part of the game that will make you think a bit when reading the rules. It’s not all that complex, but there are a few things that influence what exactly you can do here. First, there is the final experience track. It tells you how many fattorini della pizza you can send out. Then there is the delivery tile with its two numbers. The one tells you how many tiles each of your fattorini may move, the other how many pizzas you may deliver in total. That’s an important distinction there, one number is per fattorini, the other is total. That’s easy to mix up, unfortunately. And with all those numbers you still have to come up with routes for your delivery scooters. Each fattorino starts in one pizzeria and can only take pizzas from there. He can not stop at another pizzeria to fill up. Also, a route must strictly go forward, no backtracking allowed. Along that route you may deliver pizza to any customer you pass. In the real world, you would do so for money. Not so in Papà Paolo. Here, when you have delivered pizza to all customers on one tile, you improve on the experience track of the same color as the roofs on that tile. This brings the pizza delivery business full circle. You deliver pizza to gain to experience to deliver more pizza to gain even more experience. This constant improvement is necessary, too. Once a household got their pizza, they are happy for the rest of the game. Every round, you have to find new customers to supply. And because you pick the low-hanging tomatoes early, delivering becomes more complicated as the game goes on. When the game ends after five rounds, your progress on the experience bars has another important purpose: victory points! For each track where you reached the last space, Papà Paolo will reward you for your mastery. He also likes a well-rounded business, so he’ll reward you for the progress on your lowest track. But most important for him is that pies are moved, you earn points for every pizza delivered. The player with the most points will become Paolo’s successor and carry the Rolling Pin of War against the deep fried aggressors. Money, it turns out, is only a tie-breaker. A true pizzaiolo is in the business for the food, not for the profit. Nothing about Papà Paolo is particularly complex, the rules are not hard to learn, but it’s deeper than it looks. The main reason is that for every decision you have conflicting interests to consider. In the worker placement, the spot you pick gives you either a tile or an action, but it’s also important for the majority counts. And after you pick a spot you still have to decide between tile or action. In the auction, your interests are the delivery tile on one hand, being start player on the other and picking a bonus tile on the third. Sorry, bad mushrooms on the pizza, lost count of hands.The point is, you make many decisions, and very few of them are simple. Between those decisions, deciding which experience track to advance gets a little lost. Which ones you improve first does change your strategy, but ultimately you only have a few routes. Getting a lot of money from sponsors or making a lot of free pizza is one big decisions. Making big express deliveries or hiring lots of regular fattorini is the other. Each will influence your options in other parts of the game, so these decisions are meaningful. There are just not that many strategic options, you win Papà Paolo on the tactical level. Since the tactical part is very engaging, that’s not a bad thing. However, I do have to mention one bad thing about Papà Paolo. Specifically, about its visual design. Don’t get me wrong, artist David Cochard did a great job. The box cover is beautiful and vibrant and the game contents look great as well. But that makes the one problem stand out more. In bad light, or if you have difficulties seeing colors, some red and yellow roofs on the city tiles are very difficult to tell apart from the background roofs. And then you get a tile with more customers than you thought, don’t deliver that one pizza, don’t get your experience… . It’s not fun when it happens, and it would have been easy to avoid. It’s sad to have this one little problem, because in all other regards I have no complaints about Papà Paolo. It’s more tactical than strategic, but the tactical decisions are fun and meaningful. The rules are easy to understand, but the game you play with them is not simple. And although you have your own neighborhood to drive around in, there is plenty of player interaction on the main board. And thanks to two simple changes when playing with two or three players, Papà Paolo works equally well with all player counts. And now I’m really hungry for some pizza.